One of our ongoing projects here at Feed Me…I’m Hungry is our ‘World Food Tour’ where we take time to find out more about culture and food from around the world by exploring recipes, cookbooks, memoirs and more. We finished Italy a while ago but, it’s our favorite so we came back for another visit. I often say, “I should have been born Italian.” This is not because I don’t identify with my own heritage. I certainly do. In fact, I am very proud of my wonderfully mixed up background that spans much of the globe. Irish, Jamaican, Haitian, Lebanese, Scottish, and much more. That’s me. However, one of things I am not, is Italian. I find this to be completely against the natural order of things, because all of my favorite foods are in fact Italian. Or at least Italian-American. I adore these foods to a perhaps obsessive level. I would perfectly content to eat pasta everyday for the next 20 years. Seriously, this isn’t even much of an exaggeration, I do that kind of thing. Just ask my husband. I also identify with what I understand to be, the Italian way of eating. Marcella Hazan pointed out in her wonderful cookbook Essentials of Classic Italian Cooking, that there is no haute cuisine in Italian food because all authentic Italian cooking is family style. Feeding the family, the practice of home cooking, the connection found at the table, is the root and priority of all Italian cooking. Don’t get me wrong I enjoy trying my hand at intricate desserts and styling a beautiful plate… sometimes. Yet, when it comes to my everyday cooking, I want to feed my family delicious and healthy food to sustain them. I don’t want to buy wildly expensive ingredients. I don’t want to spend hours and hours cooking unless I can put it on the stove and more or less forget about it for a while. I want simplicity. At least according to the brilliant Hazan, this is Italian food at it’s roots. Much of Italian food stems from ‘peasant’ cooking. Normal working people cooking for their families. As a result, certain principals are naturally built in. Such as, cooking with fresh seasonal produce. Families often cooked from their own home gardens, obviously ensuring that food was fresh and seasonal. There also wasn’t extra money or the convenience of the modern grocery store to pick up fancy ingredients. As you also might imagine, the principal of not wasting is built right into the cooking style as well. With magnificent results I might add. Think of the slow cooked ragù that Italy is famed for. That’s economical thriftiness at it’s absolute best: meat is expensive and you would never waste any of it, even if it is chewy and unappetizing. Instead you develop an ingenious way to tenderize it and achieve a hearty, delicious meal to feed your family! Don’t worry, I’m not trying to romanticize the life of a peasant. Truly, I very much appreciate the modern conveniences of the grocery store. At the same time, there is something to this way of cooking , isn’t there? Even in the modern food world we value these same things. Fancy restaurants, root vegetables, and seasonal ingredients aside, you have to admit, Italian cooking is pretty brilliant right? In my humble opinion, one other brilliant bit about the Italian way of eating is the bread. No stupid low carb nonsense here. Beautiful bread. 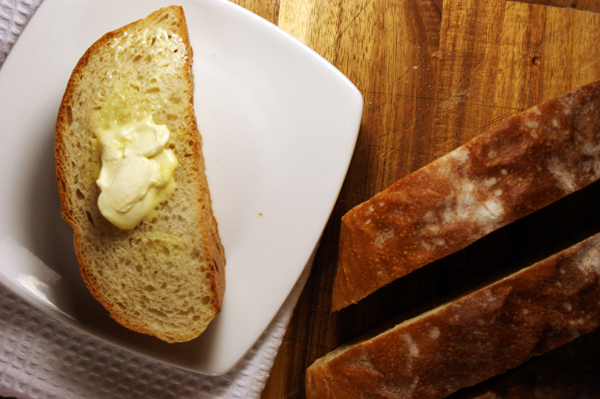 Be it focaccia or a perfect Italian loaf, bread is definitely on the table. I bake a lot. I’ve attempted many different bread recipes but, I’ve often been frustrated by my inability to achieve a bakery perfect crust. You want it for artisan style breads of all sorts be they a baguette or a loaf. The best thing I’ve tried is the water in the hot pan trick and it works, sort of. However, I’ve finally discovered the perfect method and I’m going to let you in on the secret. Drum roll please. The big secret is a skillet. Instead of any old hot pan in the bottom of your oven while you bake your bread, you need a skillet. Why? Skillets get piping hot in the oven. (Which is why they vastly improve pizza cooked in the home oven.) So when you splash that cup of hot water in the pan and shut the oven up real quick, a ton of steam is produced. 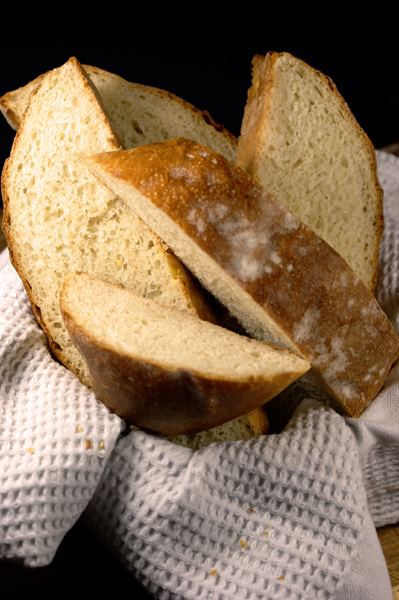 Enough to really make the texture of your bread crust right. As in a crisp outer layer, a slightly chewy layer just underneath, and a soft but dense inside. I know, I know, I’m making you want to break out the butter or olive oil and have a slice right now. 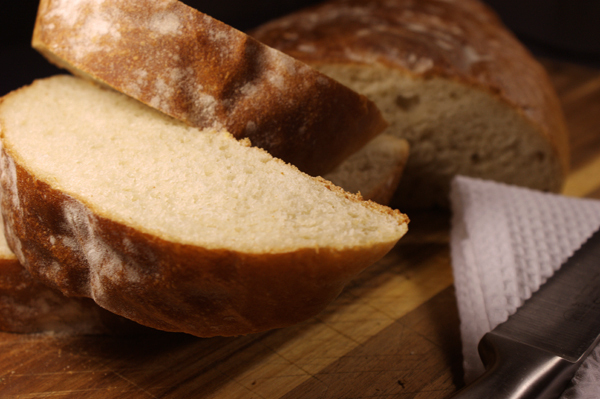 Unfortunately you are going to have to wait until you finish baking your own loaf but, I promise it’s worth the wait! You too will achieve the perfect crust. So set aside some of your favorite olive oil for dipping and get baking. 1. In the bowl of a large stand mixer add the yeast and sugar. Pour the water gentile over the yeast. Allow the bowl to sit for 10 minutes. The yeast will begin to foam. 2. Add the olive oil, salt, and flour to the mixing bowl. Using the dough hook mix on the dough setting, until a smooth dough forms. 3. Lightly oil a large bowl for the dough to rise in. Place the dough, in a ball in the center, and cover lightly with a towel. Place the bowl in a warm location to rise for 1 and 1/2 hours. The dough will double to triple in size. 4. After the dough has risen punch it down and turn out on to a lightly floured surface. Using lightly flowered hands roll the dough up to form a ball. Seal the bottom of the ball well. Shape the dough into a long oval shape with ends tapered and rounded. Place on a baking sheet and cover with a lightly floured towel. Set in a warm place and allow the dough to rise for an additional 30 minutes. 5. Arrange the oven racks so that the first rack is placed in the center and the second is placed in the bottom slot. Place a grilling style skillet pan on the bottom rack of the oven. (Cover any parts that are not oven safe with a layer of tin foil for protection.) Preheat the oven to 400*. Allow the oven to heat for at least 10 minutes past reaching temperature. This allows the skillet to heat as well. 6. Make the egg was by whisking together the egg and a splash of water. Brush the loaf with the egg wash. Using a very sharp knife make three cuts in the top of the loaf at a 45* angle. The cuts should be about 1/4 of an inch deep. 7. Prepare your cup of hot water and set it somewhere near the oven. Place the baking sheet and loaf on the center oven rack. Pour the hot water directly on to the skillet pan as quickly as possible and quickly shut the oven. Bake the loaf at 400* for 40-45 minutes. The loaf will be golden brown and make a hollow this when tapped on. Special thanks to Brown Eyed Baker, who I adapted my recipe from!